The holiday season is now upon us and there are only a few more weeks to shop. Did you know that we not only build military shadow boxes, but we also provide personalized gifts? If you are having a hard time finding a gift for that special someone in your life, come see what we have to offer. We carry many gifts in stock and most orders can be filled within 3-5 business days. We carry personalized coffee mugs, travel mugs, key chains, jewelry, and many fine unique gifts that all can be personalized for your needs, so come see what we can do for you. We are now coming to the end of our fall sports season for youth football, soccer and Cross Country and the high schools will finish shortly behind. Now is the time to get your recognition awards ordered before there is a backlog and products need to be back ordered. Show that special coach or player how much they are appreciated. Military Retirements: if you are retiring within next 6 months, now is the time to start thinking about your shadow box. Don’t wait until the last minute. Shadow boxes take a few weeks to build and ship so be proactive and be searching all the websites now for that case just for you. We carry a full line of shadow boxes and flag cases. If you don’t see what you want on our site, call us and we can design a case just for you. Military Carvings: wooden carvings of rank and breast insignias are a great gift for anyone’s retirement or simply a Christmas gift. Christmas is only 7 weeks away, so check out our website and find that special gift. Basement Woodworks is pleased to offer custom patches and challenge coins. Just go to our website and upload your artwork and tell us the quantity. We will send you a quote at no obligation. Pricing charts are available on the site. Our high quality coins and patches are used from military units to youth sports team. Check it out today. Two new Items just added to our store. 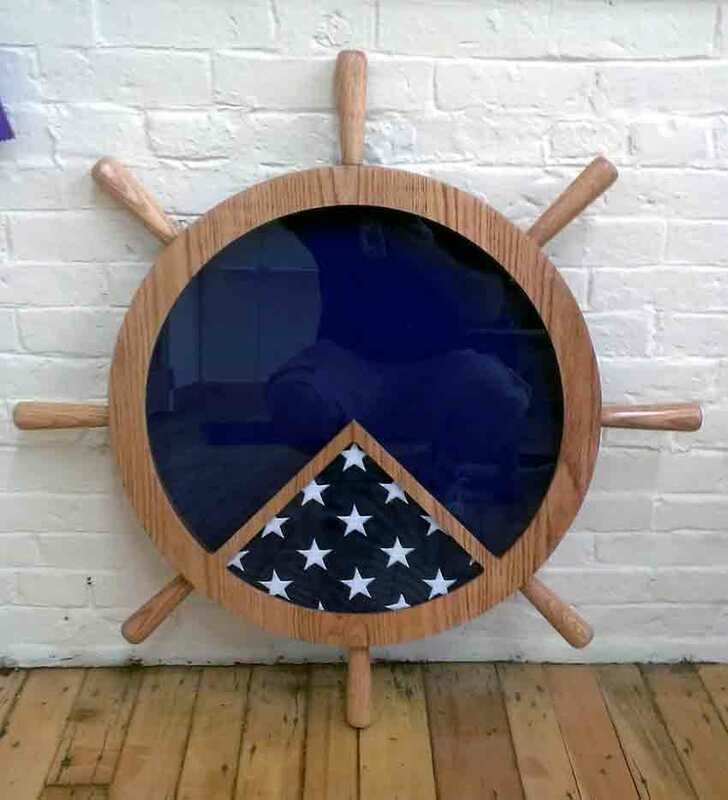 First, our own 24″ ships wheel shadow box (overall size is approximately 35″ with the handles) The ships wheel can be made in Oak, Mahogany, Walnut and Cherry and is 2″ in overall depth. Each handle is hand turned and the main body is carved from a solid block of wood. Your choice of backer color, Blue, Black, Red, or Green. Next we have added a new 9″ x 12″ solid walnut Deckplate Leadership plaque with a 3D carving of the Navy MCPO, SCPO, and CPO insignias and laser engravable plate. See website for details and pricing. We have just released our new website with a new design and format. Hopefully you will find it easier to navigate and you will also find more products with a wider variety of options to choose from. New to the site is our premium line of laser engravable plaques, acrylic awards, and executive gift collection. Please continue to check back, as we will be continuously adding more product each day. 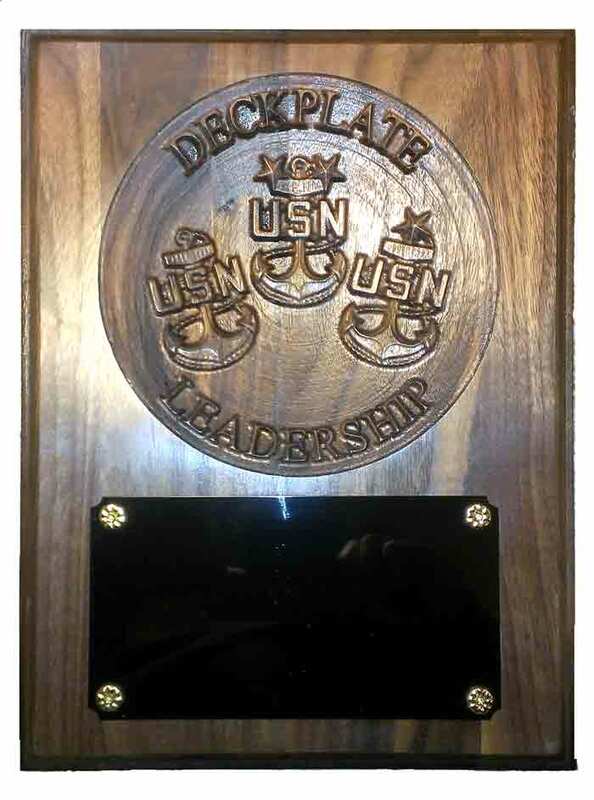 In addition to building shadow boxes we are also a full service trophy and awards shop where you can get plaques for employee recognition, trophies for sports teams, simple engravings on brass, acrylic or glass, The carvings that we create can be made as a “stand alone” plaque or can be three dimensionally carved into a standard solid wood plaque. These plaques make excellent gifts for retiring personnel or as a “going away” gift. Generally speaking traditional shadow boxes are all the same style with an awards compartment on the bottom and a triangular shaped flag case on top. Many of the traditional shadow boxes an the market today will have one, two, or three award compartments to place your medals and ribbons from your military career. Our traditional style shadow boxes have numerous configurations to fit your style and needs. According to some accounts of naval history and tradition, when a sailor retires and is departing the ship for the last time, it’s considered bad luck for the sailor’s shadow to touch land before he/she does. Thus, the sailor’s shipmates would construct a sturdy box, hand-crafted of the finest materials, in which to display mementos of the sailor’s accomplishments — thereby symbolically creating a “shadow” of the sailor. The box safely contains the sailor’s “shadow” until he/she is safely ashore, at which time the shadow box can be given to the sailor in a presentation ceremony. Historically, when a sailor would join a ship’s crew, he would join that ship for his entire career. During the sailor’s voyages to ports of call around the world, he would collect many trinkets, souvenirs, and reminders of his travels. Naturally, as space aboard ship was at a premium, these items tended to be small. When the sailor piped ashore for the last time, his shipmates saw to it that a special ceremonial box was constructed for him. The box would hold all the possessions that had been collected during those many voyages, a and would simultaneously symbolize the sailor’s career and time aboard ship. Ideally, a shadow box serves not only as a reminder of achievements and accomplishments, but also as a summation, a culmination, of a career. A shadow box should enable a stranger glancing at its contents to gain a substantial understanding of the owner’s past service and achievements. Shadow Boxes are born of an ancient naval tradition that’s still practiced today, both in the militaries of the world and throughout civilian life. 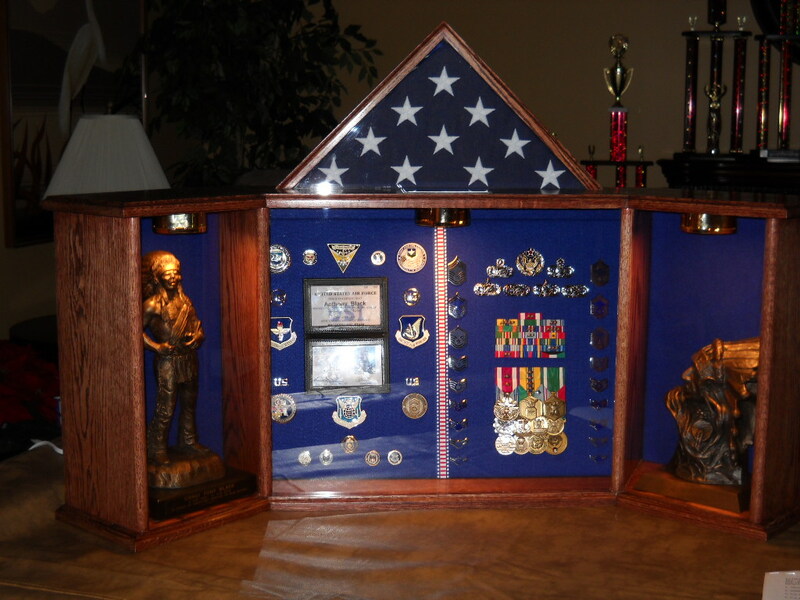 The Shadow Box is laden with items that represent the recipient’s service or accomplishments or achievements. The shadow box is typically laden with personal items that depict advancement and achievements. These may include personal awards, medals, duty stations, insignia, rating badges and uniform devices that indicate progression through various military ranks. A boatswain’s whistle may even be included as a reminder of both service aboard ship and the ceremony at which the shadow box was presented. Basement Woodworks is pleased to announce that we now offer Challenge Coins. Although there are several stories detailing the origins of the challenge coin. According to the most common story, challenge coins originated during World War I. American volunteers from all parts of the country filled the newly formed flying squadrons. Some were wealthy scions attending colleges such as Yale and Harvard who quit in mid-term to join the war. In one squadron, a wealthy lieutenant ordered medallions struck in solid bronze and presented them to his unit. One young pilot placed the medallion in a small leather pouch that he wore about his neck. Shortly after acquiring the medallion, the pilots’ aircraft was severely damaged by ground fire. He was forced to land behind enemy lines and was immediately captured by a German patrol. In order to discourage his escape, the Germans took all of his personal identification except for the small leather pouch around his neck. In the meantime, he was taken to a small French town near the front. Taking advantage of a bombardment that night, he escaped. However, he was without personal identification. He succeeded in avoiding German patrols by donning civilian attire and reached the front lines. With great difficulty, he crossed no-man’s land. Eventually, he stumbled onto a French outpost. Unfortunately, saboteurs had plagued the French in the sector. They sometimes masqueraded as civilians and wore civilian clothes. Not recognizing the young pilot’s American accent, the French thought him to be a saboteur and made ready to execute him. He had no identification to prove his allegiance, but he did have his leather pouch containing the medallion. He showed the medallion to his would-be executioners and one of his French captors recognized the squadron insignia on the medallion. They delayed his execution long enough for him to confirm his identity. Instead of shooting him they gave him a bottle of wine. If you are interested in Challenge coins please contact us at 207-725-8980 or via email at accolade4me@basementwoodworks.com for pricing.